There’s an ad running on TV now that encourages people to make different beverage choices, to avoid the high amount of sugar or high fructose corn syrup in soft drinks and juice. The ad encourages a switch to water, sparkling water and tea. While you can’t go wrong with water, tea is packed with antioxidants—specifically, catechins, which make up some 25% of the dry weight of a fresh tea leaf. What if you don’t like unsweetened tea? *Sugar levels can vary in different brands of fruit juice. But first, try some really, really good tea, purchased loose in a tea shop or bottled by a premier company. Top-quality tea is so flavorful that no sugar or milk is needed. One of our favorite brands of bottled tea is Teas’ Tea, from Japanese brewer Ito-En. Among the Golden Oolong, Green Hoji, Green Jasmine, Green White, Lemongrass Green, Mint Green, Pure Green and Rose Green teas, you’ll find striking flavors that are irresistible (and calorie-free). 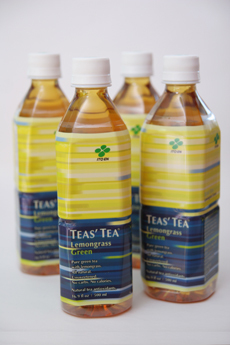 We used to drink a bottle of Green Jasmine, Lemongrass Green and Rose Green daily. In the name of green living, we subsequently bought the loose tea and started to brew our own, carrying it around in a water bottle. Now, we can’t live without it, preferring iced tea to water. If those catechins don’t deliver us to a ripe old age, we’ll have still enjoyed great refreshment. Find more of our favorite teas.